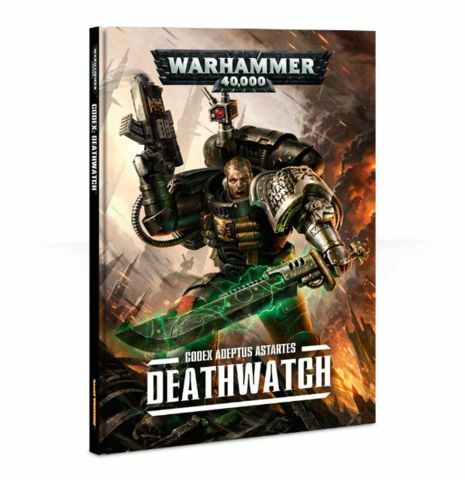 Games Workshop recently announced that the Deathwatch codex will be coming this year. This was quite a surprise, as I expected this to be one of the last to come out, being a relatively new Faction in the game. 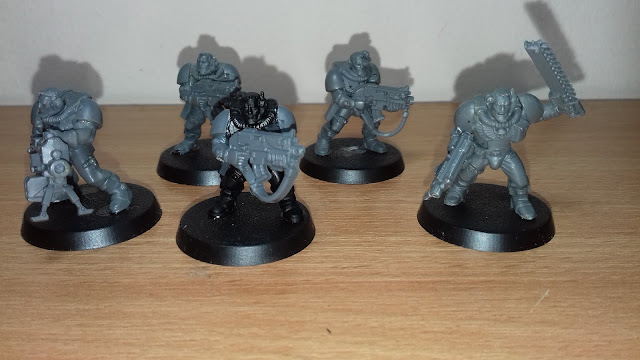 I was very happy about this, as the Deathwatch are one of my favourite armies. I love the look of the army, as well as the background for the force. 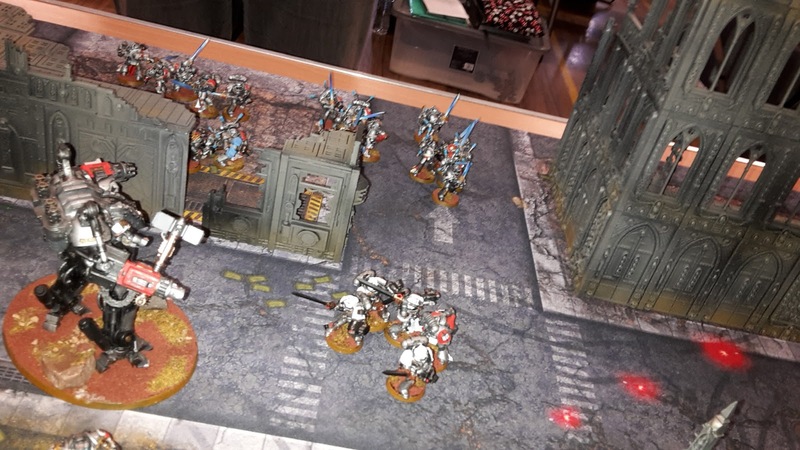 It helps that my Deathwatch are one of the armies that I have painted to a higher standard than my others, so any excuse to field it or take it to tournaments is something that I would jump at. I've made no secret of the fact that my Deathwatch are struggling in 8th edition. They are very expensive Marines that lack a lot of durability. They can hit hard in shooting and combat in the early turns, but really suffer in the long game. 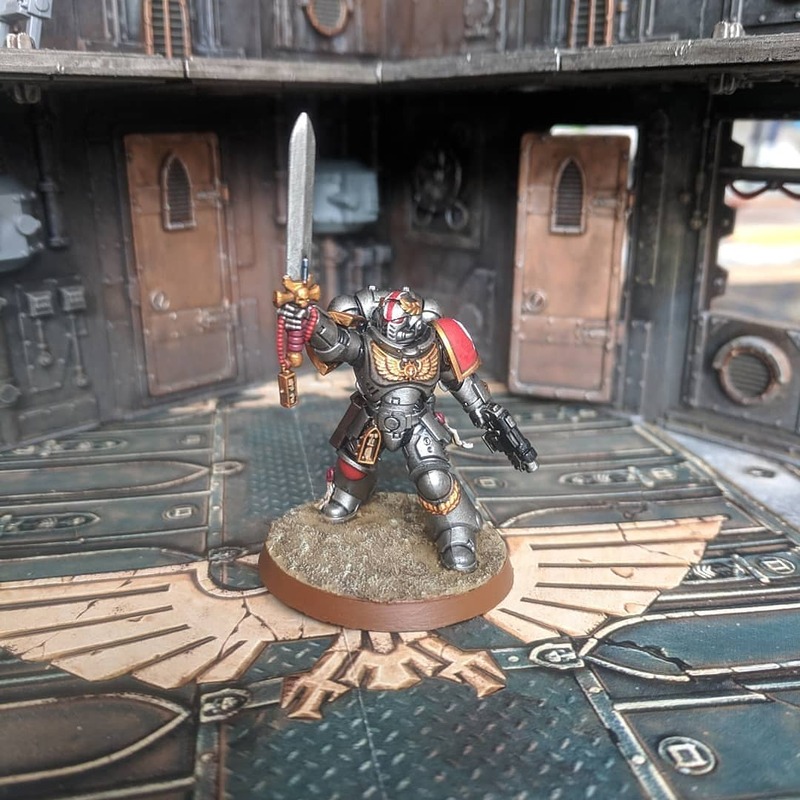 With the new codex coming out, here are some of my thoughts on what I would like to see in the book and how the Deathwatch could potentially improve. The basic Deathwatch Veteran is a little overpriced for what he can bring to the table. At 19 pts per model, he is just a Veteran Marine with some Special Issue Ammunition. This discrepancy got even worse with the release of Chapter Approved, where Primaris Intercessors went down to 18 points per model. Comparing the Deathwatch Veteran and Primaris Marine is not too favourable. The Primaris Marine costs 1 point less, but gets an extra wound and attack on their profile. 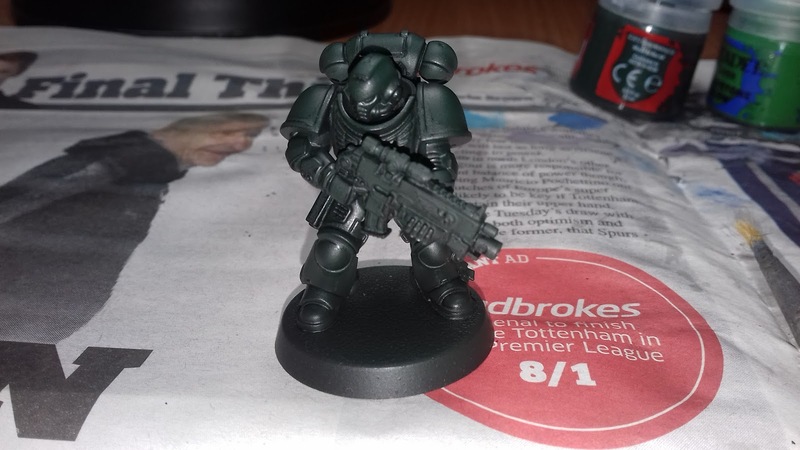 The Deathwatch Veteran does get special issue ammunition, but the Primaris Marine does get a decent basic weapon that pretty much matches one of the special issue bolts. The initial fix would be to lower the points cost of the Deathwatch Veterans. However, I'm sort of in agreement with Nick over at the Burning Eye. He mentioned a while back that the Deathwatch should remain an elite force. Lowering the points would go against this, allowing you to field more models in the army. Therefore, I think it would be nice to increase the number of wounds each model has to 2. This would take them into line with Primaris Marines and make their price comparable. Alternatively, some form of feel no pain save for the army would be a nice boost if they wanted to keep them at one wound each. 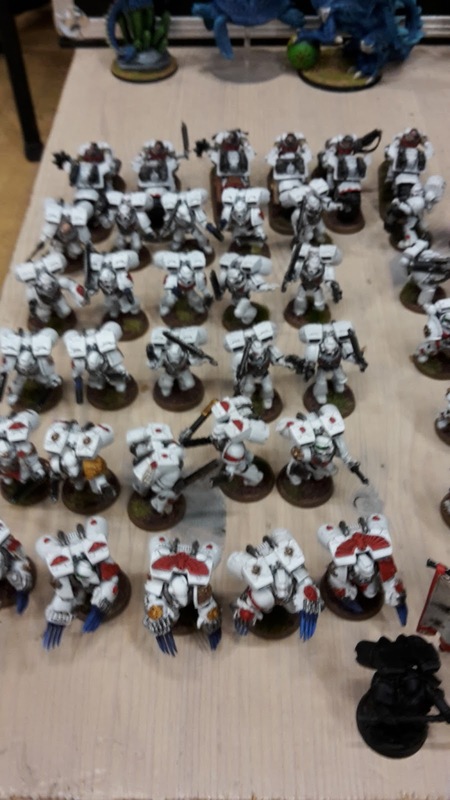 I recently attended the Greetings From the Warp 40k tournament with a new style of White Scars army than I am used to playing. 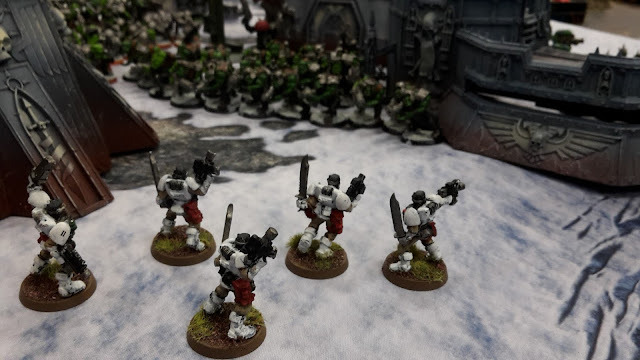 This new army focuses on massed infantry and board control in the force, and lots of Jump Pack units to take advantage of the White Scars Chapter Tactics. 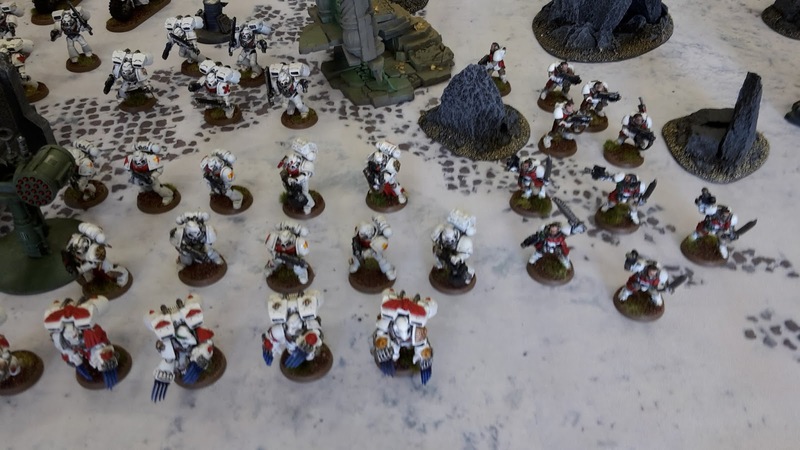 As is customary after a tournament, I'll take a look through the army to see what worked and what didn't in my games, and how I could modify the army to make it a bit more successful in the future. I'm going to take a look at each unit and see how they performed. The Captain was armed with a Thunder Hammer and the Shield Eternal. He was a solid combat character, able to put out a lot of damage in the fight phase. His Bike allows him to get into combat very quickly, especially when combined with the Born in the Saddle Stratagem. 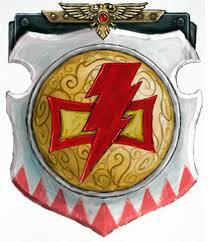 He is fairly durable, with 7 wounds, a 3+ invulnerable save and halving the damage thanks to the Shield Eternal. He was able to take on entire mobs of Orks and some tough combat characters in my games. The extra wound from the Iron Resolve warlord trait was nice, but I don't think I ever made one of the 6+ FNP saves over the course of my three games. I would consider swapping it for one of the other Space Marine warlord traits, such as the Imperium's Sword (re-roll charges and +1A on the charge), Storm of Fire (extra AP on shooting attacks for nearby units) or Champion of Humanity (+1 to hit and wound against enemy characters). The Captain probably performed best in game 1. He was able to use the Honour the Chapter stratagem to attack twice in a turn and kill off the Bloodthirster before it could do too much damage. I would definitely take the Captain on Bike again. The only change is that I would probably not be so aggressive with him all the time. I tend to rush him at the enemy army, so it is easier for him to be killed and give up warlord in my games. 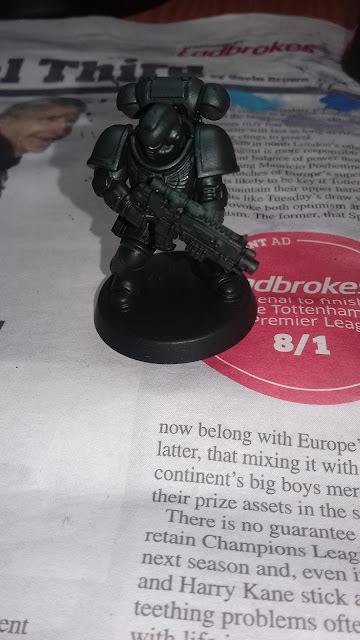 Today I have a test model that I painted for my Dark Angels army. I decided that my Dark Angels army needed a bit of a re-vamp with 8th edition. 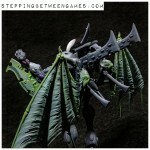 My current Dark Angels army was painted up in 3rd edition and were among the very first 40k models that I ever painted. As a result, they are looking a bit dated. 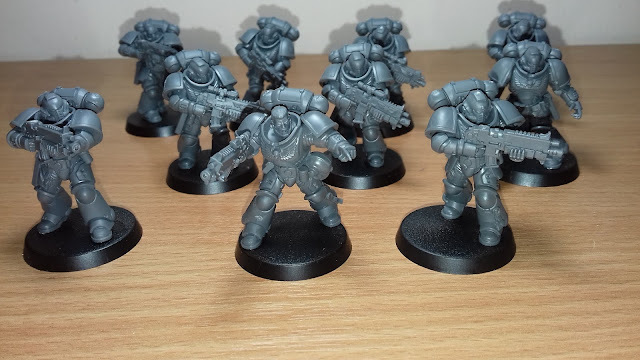 I wanted to the get the Primaris Marines painted up and decided they would do well in my Dark Angels army. 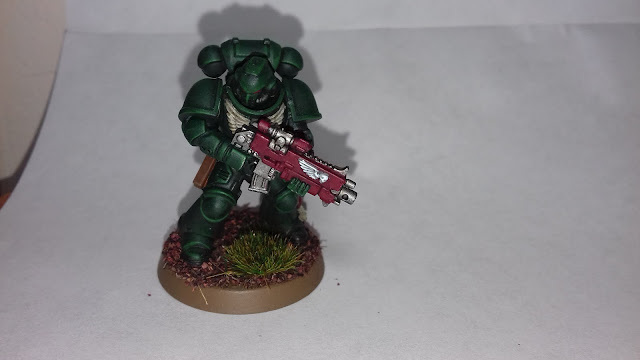 I had a look at videos on Youtube and found the Dark Angels Hellblaster video and Dark Vengeance Tactical Squad from Warhammer TV to be very useful. I painted them up with a variation on the colour schemes in the videos. I undercoated them with Caliban Green, then gave them a wash with Nuln Oil. 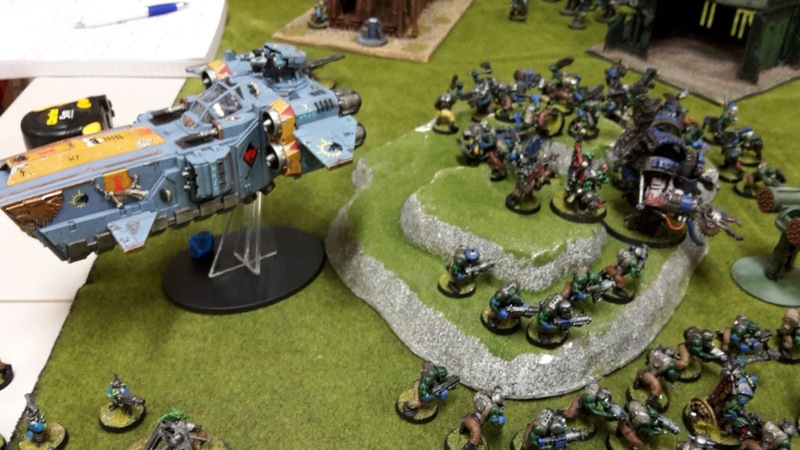 This week's battle report sees the first outing for my Orks in 8th edition 40k. 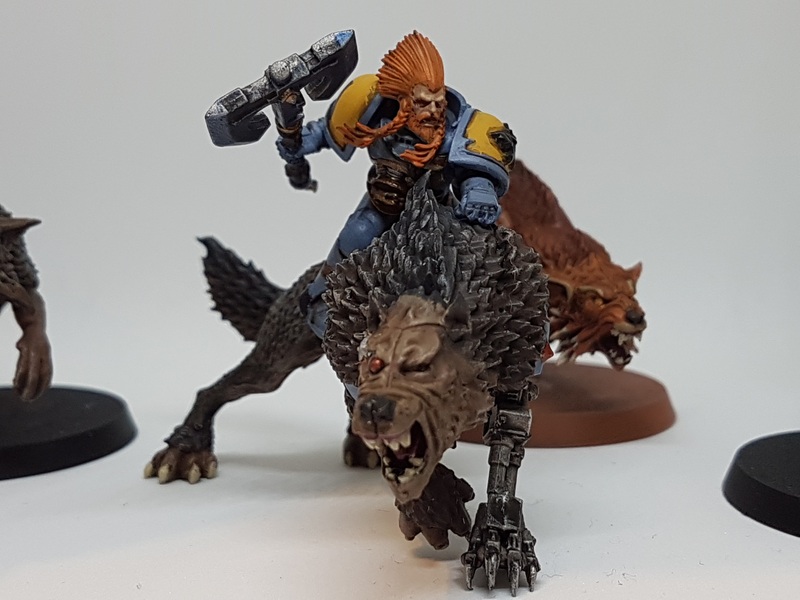 I would be taking on Ben's Space Wolves once more in an Eternal War mission. I've been playing a lot of maelstrom missions recently, but decided to give one of the new Eternal War missions from Chapter Approved a shot for this game. We decided to do a toss up between Dominate and Destroy and Ascension. This was actually a mistake, as I mixed up the rules for the two missions. For this mission, we would be using 6 objectives. Players gain a point for each objective they held at the end of their turn, as well as a kill point for each enemy unit destroyed. In addition, we used the Ascendancy rules, meaning that Characters control the objective if they are in range. In addition, they score bonus points for each consecutive turn they hold the objective. This was totally a conscious effort to spice up the mission and not down to me confusing the two scenarios.......... honest. 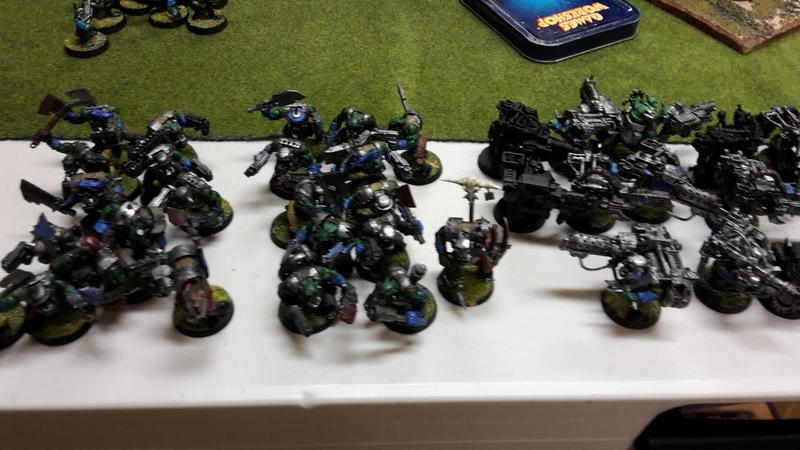 I decided to take a mix of units as this was my first time out with the Orks. I thought the Painboy was a HQ unit by mistake, so thought I had 2 Battalions, but wouldn't have been able to field them due to lacking a fourth HQ unit. 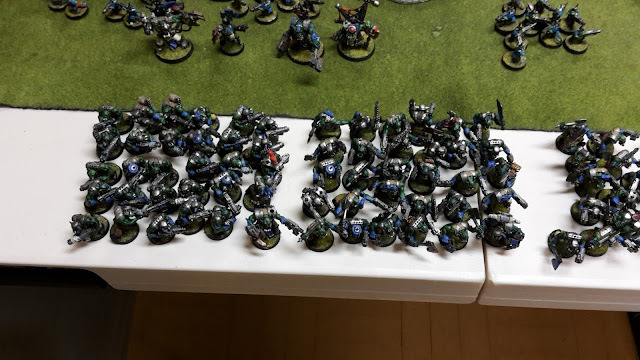 I took two big mobs of Boyz to move towards the enemy army. They were backed up by two Warbosses, allowing them to advance and charge and giving them some morale mitigation. In the backfield, I had two units of Grots, three Mek guns and Lootas. 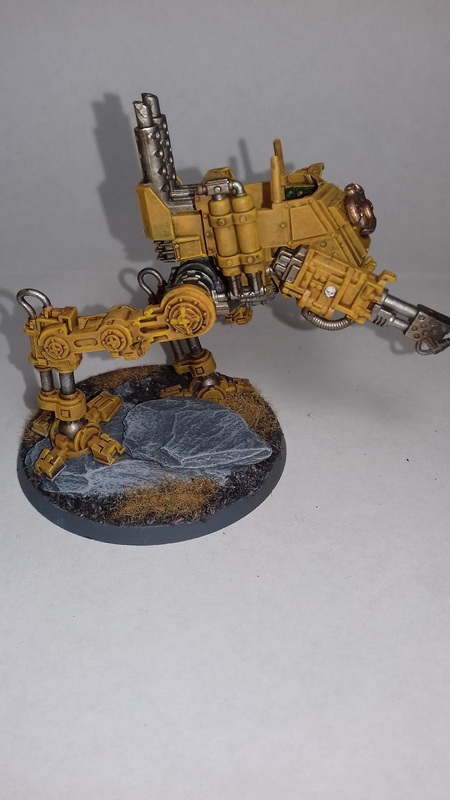 The faster elements of the army were the Stormboyz and two units of Trukk Boyz. 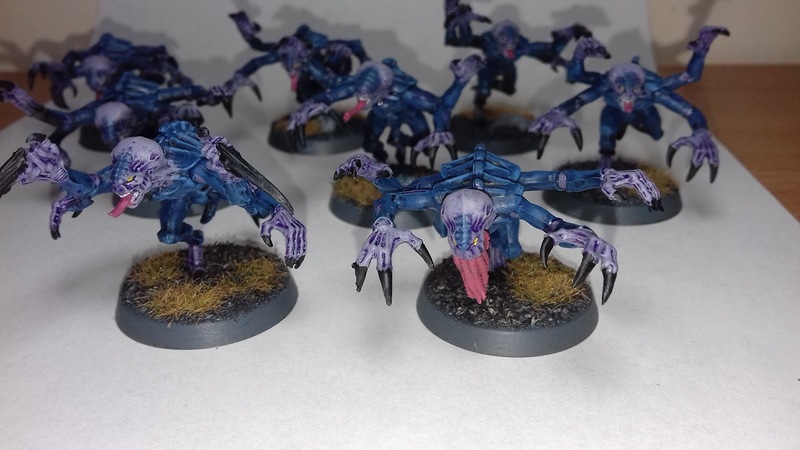 Today's Hobby Update features some work in progress on my Genestealer Cults Scout Sentinels. I had previously done some work on these models, but they had taken a back seat recently as I worked on painting some reinforcements for my White Scars. This week's Hobby Sunday features some more completed Purestrain Genestealers for my Genestealer Cults army. These 8 Purestrains will be added to the ten that I already have in the army. I have another 16 to assemble and paint up to give me two units in my army. These are a really strong unit in the army, able to put out a lot of attacks and able to go through enemy armour saves more effectively. 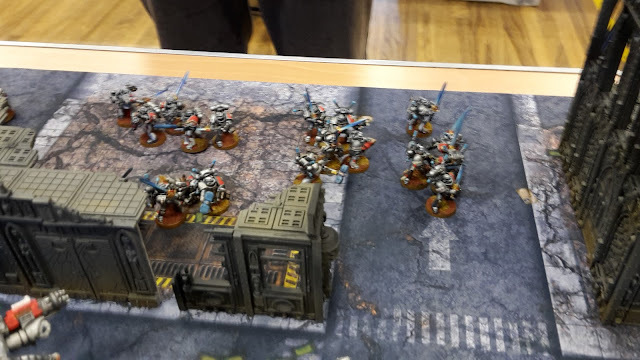 There were some fantastic armies on display at the recent tournament I attended, held by Greetings From the Warp. 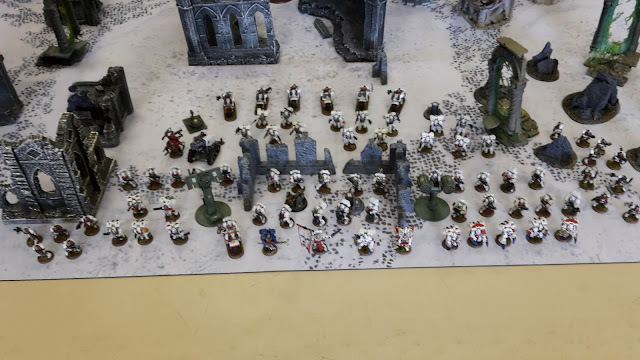 Here are some pics of the armies, as well as some of the awesome board set ups used on the day. In my final game of the tournament, I would be facing Mark and his Ork army. The third mission of the day was Targets of Opportunity with the Vanguard Strike deployment zone. This is the mission where you only get one turn to score your three cards, having to draw new cards each turn. The board featured some more fantastic scenery with a lot of line of sight blocking terrain and a large section in the middle. This would be useful, potentially forcing Mark to split his army to come at my gunline. The Biker Captain was my warlord. Game 2 of the Greetings From the Warp tournament saw my White Scars Space Marines taking on Ken and his Grey Knights army. 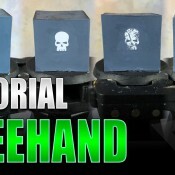 The mission for game 2 was the Kill Confirmed Maelstrom of War mission with Hammer and Anvil deployment. This was the mission I was most worried about of the three. My army does well at maelstrom games, but my MSU style army can give up a lot of kill points. I had yet to face the Grey Knights since the codex was released. My experiences with the in the index were not great, struggling against the army with my Deathwatch. 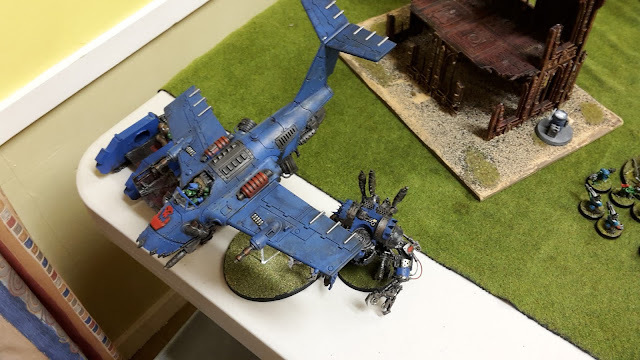 The Stormraven is still a tough unit to take down. Hopefully, I would have some good firepower to take it out quickly. Welcome to the first battle report from a recent tournament that I attended. The tournament was held by Greetings From the Warp, and consisted of three games of maelstrom of war. 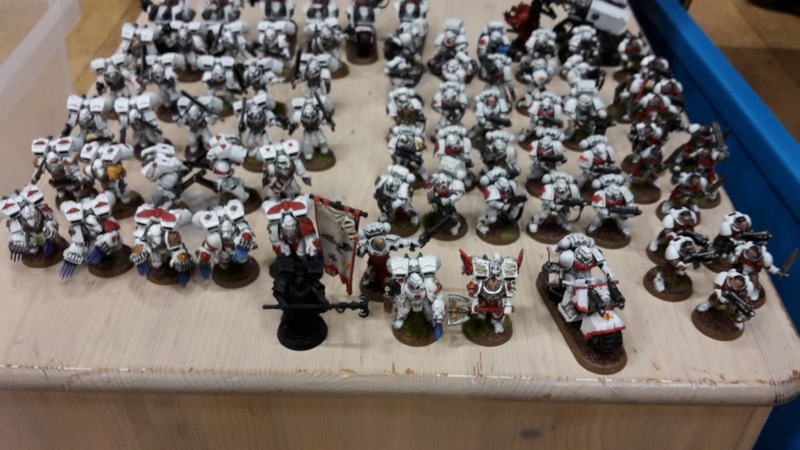 For the tournament, I have been practicing with a new type of army for my White Scars Space Marines. This army focuses on infantry and board control, with some potent firepower and close combat units. Game 1 saw me facing off against Justin and his Chaos Space Marine and Chaos Daemon army. If you are on Instagram, you can follow Justin at BlueMarbleChomper. (Remember, you can now follow the St Andrews Wargaming Facebook page to keep up to date on all the latest battle reports too). First off, let me say that the guys at Greetings From the Warp put on a great event. The tables looked amazing, with plenty of terrain, and the standard of the armies was really high as well. They were great to chat with and were very helpful throughout the day. I hope to attend many of their events in the future. The first game was the Sealed Orders maelstrom mission with Dawn of War deployment. In this mission, you start with 6 maelstrom cards that you keep secret from your opponent. Once you have scored/discarded your initial 6 cards, you draw 5 more, then 4, then 3, etc. This means that a bad hand can stay with you for a while, making it harder to score. The Biker Captain was my warlord. I have been having some success with the army in maelstrom games, as I have a lot of units for holding objectives and fast units to grab them. 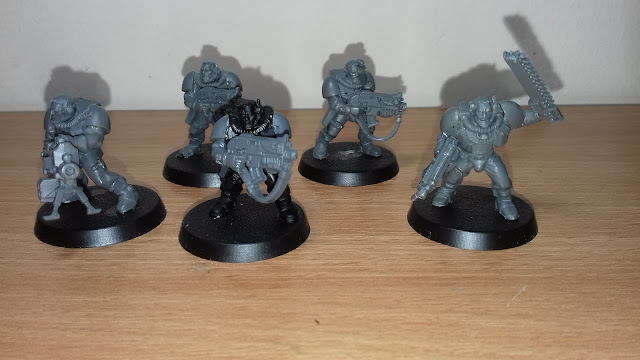 For this week's hobby Sunday, I have been assembling some new units for my Dark Angels army. I decided to re-vamp my Dark Angels army for 8th edition. My Ravenwing army looks good on the tabletop, but my Green Wing Marines are looking a bit dated. 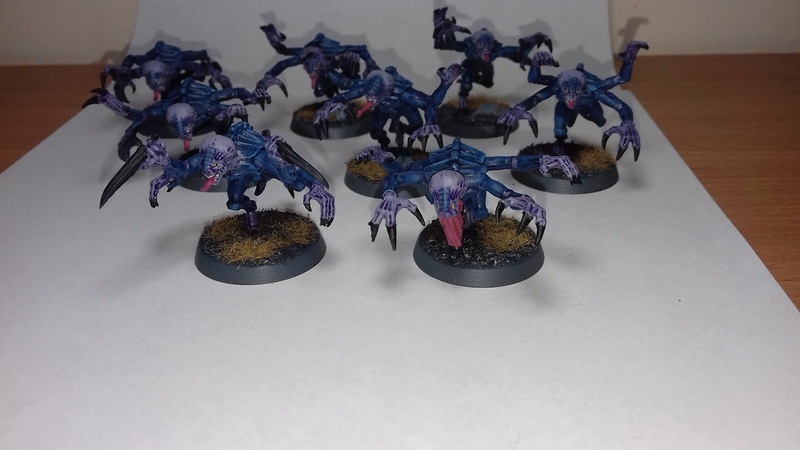 They are all from 3rd edition and the first models I painted, so they are not great. I've also been thinking about making the army playable as a tournament force in 8th edition, so wanted to add some new units to the army, as well as trying to improve the paint job on them. First up, we have a couple of units of Scouts. Scouts are a fantastic unit in 8th edition, great for giving the army a high degree of board control. For more info, you can check out my review on Frontline Gaming. 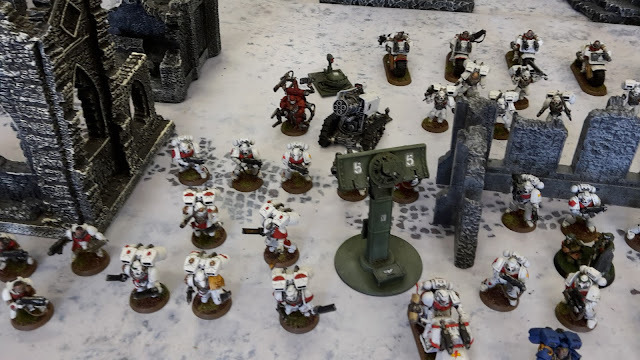 This week's battle report sees my White Scars tournament army take on Stu's Adeptus Mechanicus army in the Targets of Opportunity Maelstrom of war mission. 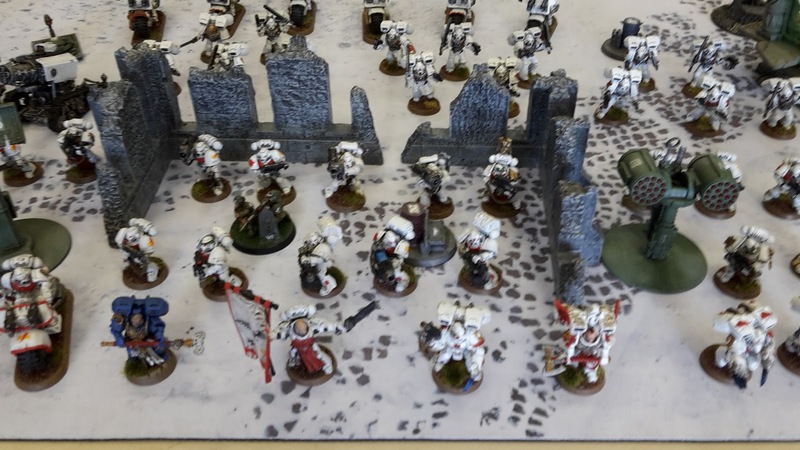 I was continuing my practice with my new White Scars tournament list. After last week's crushing defeat to the Daemons, I was hoping to put some of those lessons into practice in this game. As a reminder, you can follow me on facebook @standwargaming for regular updates and chats. 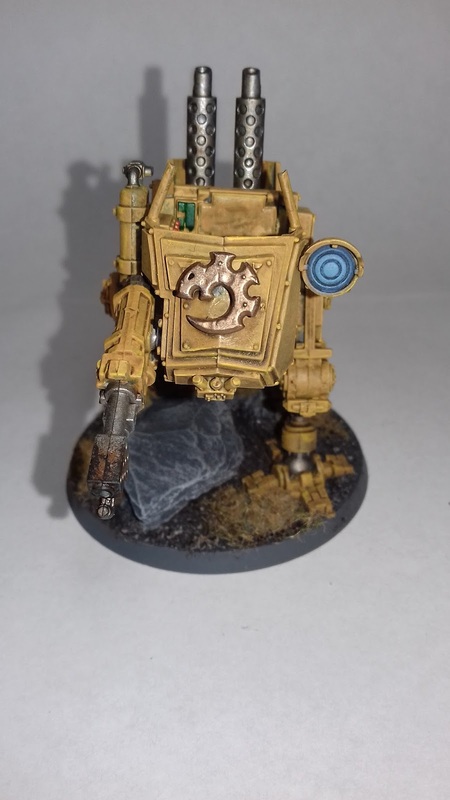 The army has a lot of fast moving and reserves elements, as well as a solid firebase to trouble the Mechanicus forces. The Librarian's psychic powers were not optimal for this opponent, but those were the powers I was taking to cover a range of opponents, so decided to keep them to see how I would fare. I've finally got round to setting up a Facebook page for the blog. Hopefully, this will allow me to engage more with those of you reading the blog, as well as share more regular updates and chat. It will also allow me to share other great content from fellow bloggers and Youtube videos that I am viewing. If you are interested, please follow the link to join in! This week's Better Know A Blogger features Jacob from Must Contain Minis. That’s me, playing a game of Bolt Action. Photo by Jeremy Cada of Forbes Hobbies. 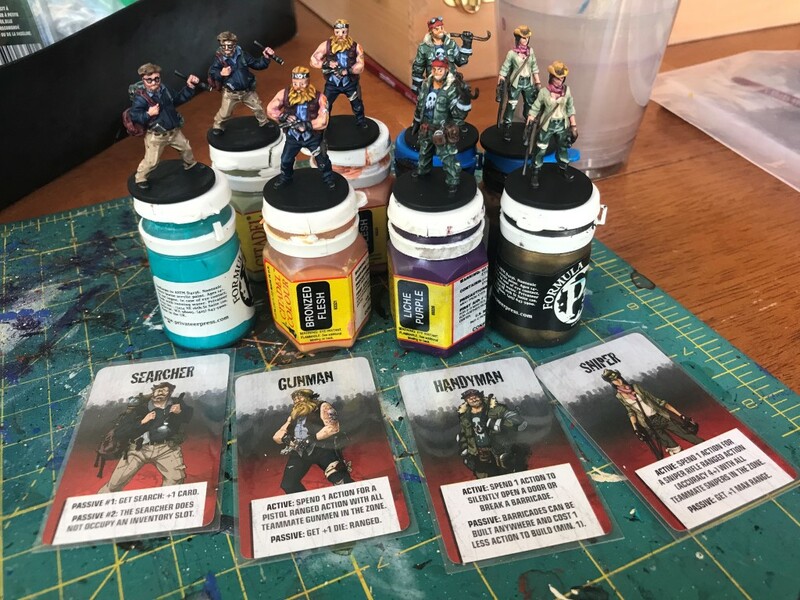 The first thing that strike me about Must Contain Minis is that it is a very well put together blog. I know we all do this for fun, but a great looking and laid out blog is a great draw to readers and commenters to want to get engaged. Jacob's blog has a strong focus on games reviews and showcases. 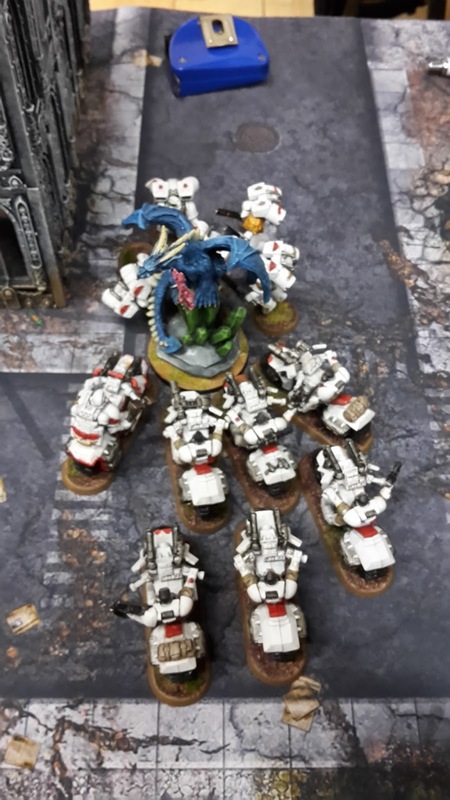 It can be all too easy to get stuck in our 40k bubble, so this is a great way to check out other great miniatures games that are out there, with some great insight into what to try next time you get burned out by 40k. For those of you with your own blogs, be sure to check out his recent article on effective use of social media to promote your writing. I was 9 to 10 years old when I got into gaming. My love of gaming started with the discovery of Choose-Your-Own-Adventure Books followed by Fighting-Fantasy Novels and ultimately a book called Dungeoneer (an RPG based on the Fight-Fantasy Series). From there, I explored other Role-Playing Games including various editions of Dungeons and Dragons, RIFTS, Palladium Fantasy, Star Wars RPG and GURPS. Over time, I realized that I was more of a roll-player than a role-player. I was even trying to create small skirmish style miniatures games using the Dungeons and Dragons Red Box Set and later the RIFTS RPG. At the time, I did not know about miniatures games even though I was trying to recreate them with graph paper, paper terrain and miniature-sized paper standees. GURPS was the first game that I got into that had better Miniatures type rules followed by D&D 3rd Edition. It became clear to me that RPGs weren’t filling the niche that I wanted to scratch. When I was 18 or 19, a friend introduced me to Necromunda (my first true miniatures gaming experience). Wow!!! I found what I was missing! Using a “loaner” gang I was able to able to play through a campaign with some friends. 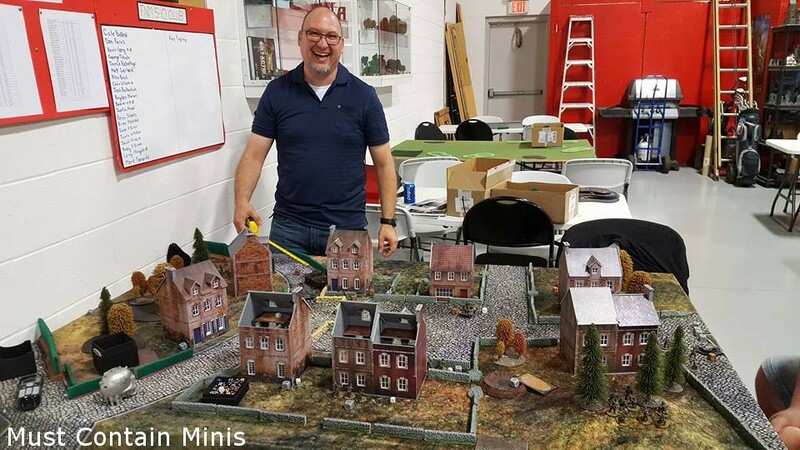 Unfortunately, some aspects of my life kept me out of the miniatures gaming scene for a long time. 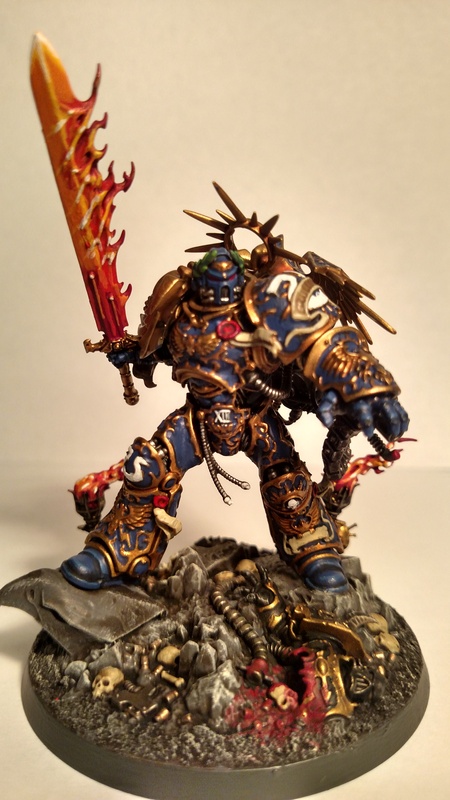 I was 26 when I bought my first true miniatures army. That army was the Space Marines for Warhammer 40,000. After that, I bought in and out of Warhammer several times. Each time I left, it was for the same reason - the price of new models. Their models are beautiful, but pricy for someone on a budget. In my early 30s, I finally dived deeply into the world of miniatures. 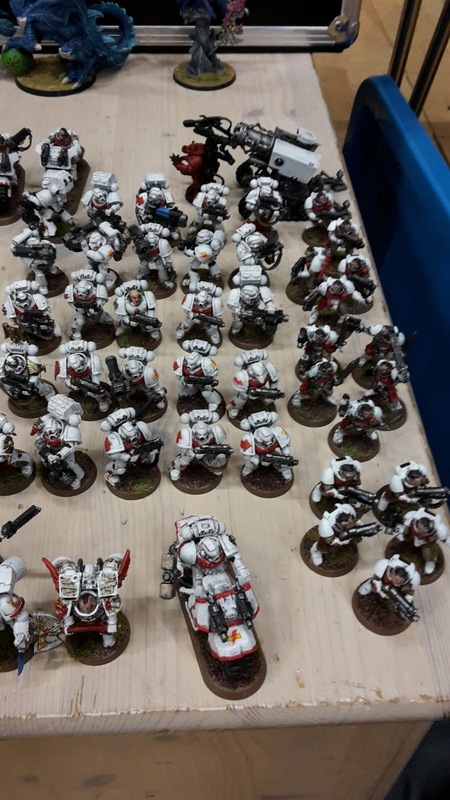 After some time trying to scratch the tabletop wargaming itch by painting board games with miniatures, I went to my first miniatures wargame convention - Hotlead in Stratford, Ontario, Canada. It was awesome! At Hotlead, I played a game called USX: Modern Day Heroes by RAFM. I had a lot of fun at that convention and learned that you can game on a budget. There is no reason to limit yourself to just a single game. For the price of a single army in another game, I can buy into multiple other systems. There are so many options out there!!! 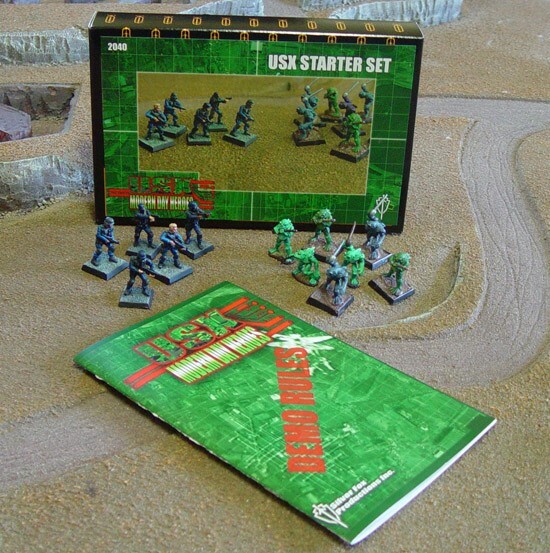 $40 Canadian still gets you this USX Starter Set with 17 metal miniatures and a 20-page rule book. The set comes with 5 SWAT Team Members and 12 Deep Ones. If you like the minis, this is a good box to pick up. I think part of what drew me to this game is my love for the old PC Game X-Com: Terror From the Deep and the fact that USX: Modern Day Heroes mixes elements of Cthulhu with modern times. Image from RAFM’s Webstore. 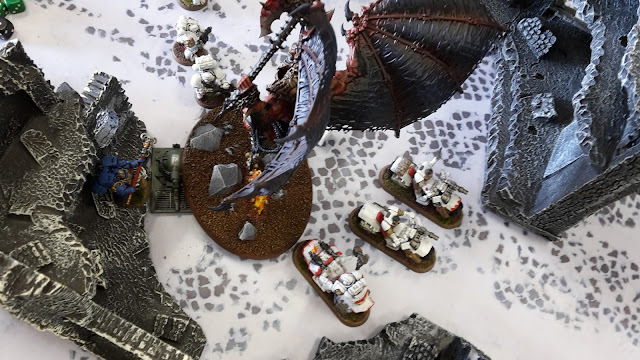 This week's battle report sees my White Scars take on Bert's Chaos Daemons army in a maelstrom of war mission. 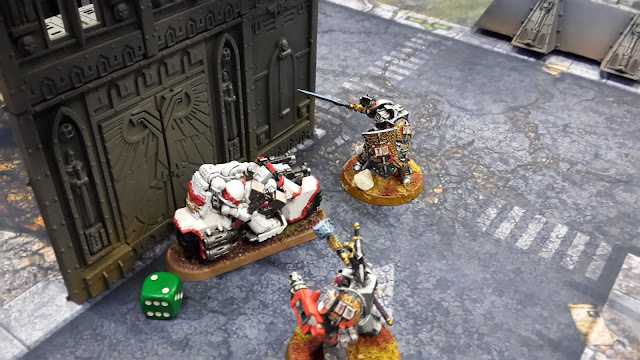 I've been testing a new White Scars list for an upcoming maelstrom tournament (now past at this point). This new list was a bit of a departure for my White Scars, which consisted of lots of Bikes in 7th edition. I've based it on some of the gaming articles on Frontline Gaming and wanted to see if I would have any success with the army. As you can see, a bit of a change for my White Scars. I decided to go for a Brigade detachment to get maximum command points for my list. The characters are in the list to be the heavy hitters and to provide some nice re-rolls for the rest of the force. 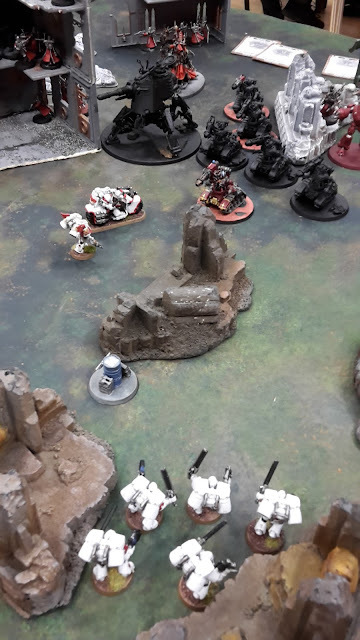 The Captain on Bike is solid, with T5, 7 wounds, a 6+ FNP and the Shield Eternal to halve the damage. He can also do a bit of damage with the Thunder Hammer. 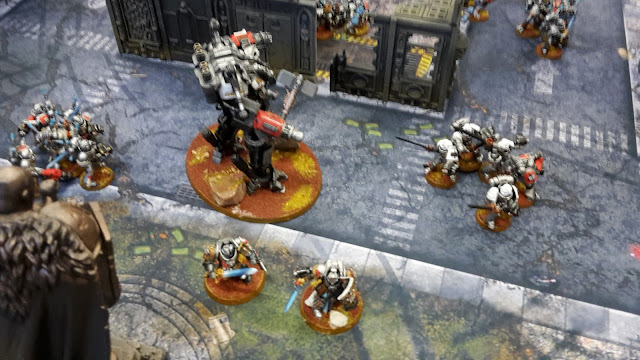 The other Captain can deep strike thanks to the Jump Pack and use the Meltagun to target other units. The Scouts are a great screening unit to block enemy deep strikers and attacks. The army also features some potent firepower from the Devastator and Tactical Squad. The Jump Pack units are great for being held in reserve to grab objectives or deployed as a counter attack force in my gunline.